Ribadavia really has a beautiful old district, but one of the other things that this town is famous for, is being the center of the Ribeiro wine region. In other words, it is the equivalent of Cambados (i.e. 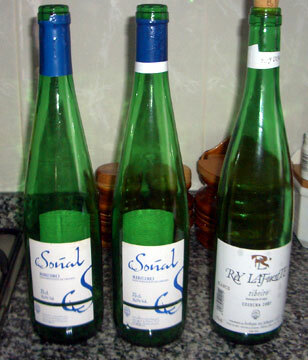 for Albarino in Pontevedra), but for Ribera in the Ourense province. For those unfamiliar with Ribeiro wine, which in truth has not taken off internationally like Albarino, here is a little bit of information. Ribeiro comes in both red and white varieties and is grown primarily in Ourense where the summers get hotter than the rest of Galicia. 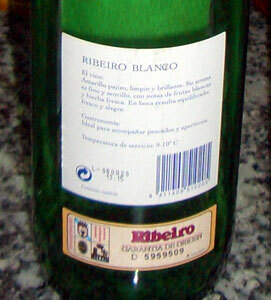 Ribeiro wine from the registered bodegas has a label of origin on the back of the bottle below the bodega's label. This is similar to the Albarino, however if you are in a restaurant you may opt for the house wine and get a perfectly acceptable bottle of Ribeiro that lacks the insignia. This just means that it was probably sourced from a very small local bodega. The photo, right, shows a couple of Ribera wines that are readily available in supermarkets. Both come in at just under or just over 3 Euros and both are light, crispy and refreshing. In fact they are ideal with Galician seafood or something like pimientos de Padron. Supermarkets in Galicia sell a number of cheap Ribeiros which I find more than palatable, but I am certainly no expert. If however, you want a good bottle you will find prices not too far away from those of a decent Albarino. In terms of taste, the white Ribeiro is considered to be drier than an Albarino, and with citrus like flavours. As for the red, it is a while since I drank a good one. To the left, the back of a bottle of Ribeiro with the regional label of origin below the bodega label. This is a must if the wine is to be sold as "genuine" Ribeiro. Personally, I have always liked Ribeiro and drunk it in preference to Albarino, but mainly because of the difference in price. However, I have tried a number of good Albarinos of late and my tastes have changed and that brings me to a very important point. Namely, where are the merchants and bodegas? We spent a day in Ribadavia and made it our quest to find the wine merchants in the town and expand our Ribeiro taste experiences. This unfortunately proved a fruitless task. Other than a couple of restaurants in the main square, there was nowhere that sold the local Ribeiro wine. We asked around and it was confirmed – one bar, one restaurant and a tourist office were the only outlets for the wine – and this is supposed to be the Ribeiro capital. On an other day when we were in Cambados (the center for Albarino wine) we recited this experience to a local wine merchant that we know and she could not believe it. It would seem that the promotion of, and professional approach to, marketing the Ribeiro brand has yet to arrive in Ribadavia. This probably explains the national and international recognition of the Albarino brand and the seeming absence of the Ribeiro equivalent. However, this should not deter anyone from visiting Ribadavia of drinking Ribeiro wine. 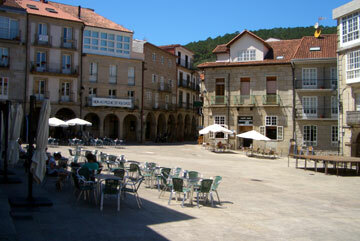 Above right, the main plaza in Ribadavia where only two or three outlets for Ribeiro appear. To make matters worse, they are primarily restaurants or shops selling the wine seemingly as a side line.